As many of you are no doubt aware, there exists two very different versions of Superman II. 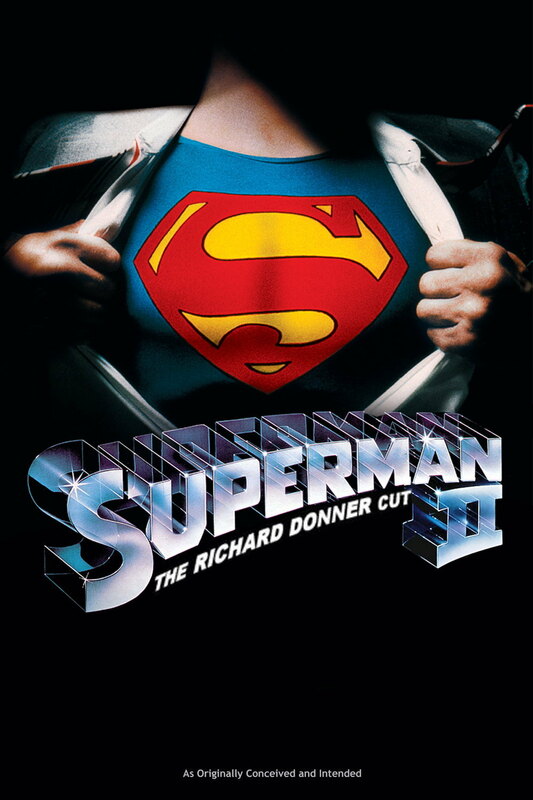 Original director Richard Donner shot most of the film’s principal photography during the production of Superman, including key scenes with stars Marlon Brando and Gene Hackman, but irreconcilable differences with the film’s producers led to him leaving the project, with Richard Lester drafted in as an 11th hour replacement. As a result, Donner’s original unifying vision for the burgeoning franchise didn’t see the light of day, until the release of the so called ‘Donner Cut’ in 2006, assembled from six tons of footage found in the archives of Technicolor Studios in London. Unlike most ‘director’s cuts’, the film differs greatly from the original theatrical release, and during the opening setup it establishes a direct through-line from the previous film. Donner’s desire to maintain a more realistic and consistent tone is apparent throughout, evidenced in part by the removal of most of Lester’s comedic moments. However, the biggest changes are in respect to narrative structure and characterisation, and personally I feel these changes make for a tighter, more balanced film, with the three main plot lines essentially boiling down to a battle for Clark’s heart, mind, and body. The first obvious shift in character concerns Lois, whose growing curiosity regarding Clark’s connection to Superman sets up a far more enjoyable dynamic between the two prior to the reveal of Clark’s secret identity; a moment created through Lois’ ingenuity as opposed to random chance. The bond between the two feels stronger throughout, and Clark’s abandoning of logic to follow his heart’s desire is more acutely motivated. Ultimately, this relationship helps him understand his place in the world, and accept the burden of the responsibility he now has as Superman, knowing deep down that he might never be able to engage in a close relationship with anyone. Marlon Brando’s extended appearance as Jor-El is perhaps the standout change from the two films, replacing Suzannah York who played Lara-El in Lester’s cut. Aside from being able to explore the father/son dynamic, it created a fresh perspective that further enhances Clark’s character. Where his mother appealed to his heart, his father appeals to his rational mind and intellect through logic, urging him to accept the gravity of the situation not to let his focus fall solely on the needs of the few. Clark makes mistakes through hubris and almost child-like selfishness, but it’s a necessary part of his development and this interaction with his father is key to how he grows into the hero he needs to be. The arc of the story’s main antagonists, General Zod, Ursa, and Non makes a much more of an impact in tandem with the narrative concerning Clark’s wishing to discharge his obligations as Superman. There are only subtle tweaks here, but the removal of the more over-the-top moments increases the tension and danger surrounding the three, and the subsequent attack on the White House has more dramatic weight as a result. Seeking to subdue the ‘Son of Jor-El’ on a physical level, each is a suitably menacing threat, but Terrence Stamp’s Zod steals the film, coming with an assuredness and bearing that makes him compelling and eminently dangerous. Gene Hackman’s second turn as Lex Luthor is somewhat overshadowed by Zod’s appearance, but is no less important, featuring true moments of genius from the character, who is cleverly placed as a complicating element of this narrative thread to avoid a potential plot overload. Perhaps my only real gripe with the film is the ending, which oddly mirrors that of the first film, and opens up a number of questions in the process. However, I believe its an acceptable flaw, and overall I would argue that the consistency in tone, and organic development of characters in Donner’s cut contributes to better film than the 1978 original, at least in terms of story if not in terms of genuine spectacle. If I recall, Donner had intended the first and second movies as seem less and the spinning time back was to be the finale to the 2nd to correct the havoc Zod created.